The animation and drawing quality are above average. In particular, the attention to detail in scenery is impressive. The storytelling is also very good. The characters are very likeable. At the beginning, you have one girl who is searching for the determination to follow through on a childhood dream of adventure, and you have another who is intensely driven on a specific personal mission of her own. The plot doesn't feel worn out and formulaic like many new series. As the episodes introduce the characters and you get to know them, the series builds momentum in a wonderful way. I highly recommend watching this one! Edit: This anime continued to impress from start to finish. This is one of those rare shows that made me wish I could give it 6 stars. Leaving Your Comfort Zone Behind...for a Colder Climate. Only one episode in, and already this show has promise. A Place Further than the Universe is a Slice of Life anime (a personal favorite genre of mine) about going so far out of your comfort zone, you're going to need a sweater. It's hard to explain with just this episode, but I think it sets the stage for something much bigger than any of us can conceive. Mari Tamaki is a second year high schooler who's afraid of wasting her high school years. She wants to change by taking small steps into adventure. When her first "adventure" (skipping school to go to Tokyo for the day) ends with her chickening out at the train station, she meets Shirase Kobuchizawa, a tall scary looking but otherwise very friendly girl with an obsession with Antarctica. Shirase's mother went missing while on polar expedition, and now she's determined to journey there to find out what happened. Shirase's Antarctica obsession (which she doesn't keep secret and will tell anyone who listens) makes her an easy target for ridicule and bullying, but her refusal to back down despite the naysayers gives Mari the courage to take a leap of faith and join Shirase on her quest to find her mother. It literally comes down to now or never. While only one episode in, the show features stunning visuals and loads of promise. I would say it's a coming of age story from the poster, but it's more of a bursting out of your comfort zone kind of story. It doesn't look like it'll be an overly complicated show to follow, as Slice of Life anime usually aren't. But it might take a little more paying attention to details than I'm used to for this genre of anime. Either way, I'm looking forward to following Mari and Shirase on their journey to the far reaches of the Earth. It's okay to take chances and it's okay to dream big. Just don't let Now become Never. This series is of course attractive to many primarily since it's the first new anime on Crunchyroll of 2018. However, it's also... good. Really good. The dialogue, animation, and overall quality is really nice, the character designs are adorable and nice without feeling overly moe, and the plotting, at least in the first episode, is very strong. It's well-paced, feels original, and doesn't get bogged down with too much detail. The narrative is well-built both technically and emotionally, well serving the characters here and making us (or me, at least) care about them and their goals. And, personally, as someone who's always wanted to travel beyond the world I knew my whole life, I really relate to those goals. I'll definitely be watching more of this to see if it lives up to my expectations. This is only an abbreviated review, so I'll keep it short. A place further than the Universe is one of the best shows that came out in winter 2017-2018. It's funny, it looks gorgeous, the character development is wonderful, and it can be really, really sad. It's just four teenagers off an Antarctic science expedition, right? The story is simple, but its exploration of friendship is not. There are a lot of layers to the four protagonists, which leads to a lot of fun and compelling banter between them. The series does a phenomenal job letting the viewer get to know the four girls, while at the same time not losing the unpredictability we would expect of humans in general, but younger people in particular. And, of course, the story is one of friendship borne of tragedy, something that adds a layer of gravitas and tension to the journey. It feels like the ending is as complete as one could get. But it would be awesome if in a few years, we got to see another expedition. A place further than the Universe merits it! Before this season started, I was compiling my list of shows I wanted to watch. This wasn't on it at first. It wasn't until I saw it was going to be on here that I decided "eh sure, why not." I didn't expect much from it. I figured it'd be a cute girls series which is very rampant this season. First episode was good but not spectacular for me. When I saw the second episode, all opinions I had on this series changed. I can't remember the last time a series had me in that much awe, let alone a single episode. And from there on, it's the one show of this season I never get more than a few hours behind on. It's consistently great. It's a fun coming of age story about wanting to go on an adventure, making friends, and not regretting anything. The girls are all very fun in their own unique ways and the animation is never lacking in the quality department. It's a wonderful series and easily one of the best, if not the best, of this winter season. PLEASE WATCH IT. The title of this show tricked me. I thought this was going to be a sci-fi adventure with action, magic, romance etc. 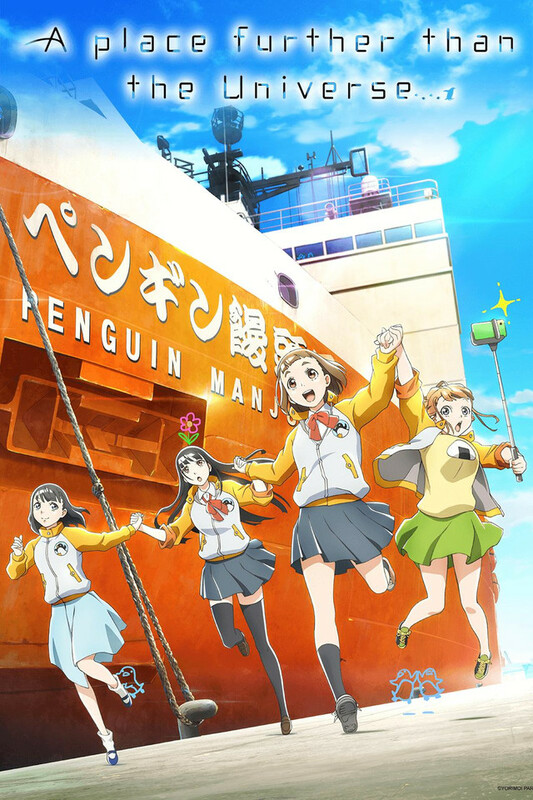 Then I find out it's about four innocent Japanese girls and their journey to Antarctica and I've been hooked ever since. Very in-depth character development. All the girls have very unique personalities. I'm really enjoying this particular "slice of life" anime. Like I said the name caught me, but I'm glad it did. I feel like I'm on the journey to Antarctica with them. I've never written a review for an anime before but this one deserves it for sure. It is beyond just good, everything works and fits perfectly the theme of exploration and discovery through this cute and funny slice of life. Madhouse has already confirmed its skils throughout the years and once again they dont disappoint the animation and soundtrack in this show is top notch very enjoyable on this point. What makes this show "beyond good" are the characters, their background and the chemistry between them that works perfectly. This bond and the events these charcaters go through in this show makes you feel unique emotions. In the feels scale this anime joins the big boys in my list such as : Clannad, Anohana, Angel beats, ... In only 13 episodes this show managed to make me tear up on almost all of them, It is THAT GOOD ! I can't recommend this anime enough, definitely a must watch ! First episode and I am already hooked and can't wait for the next episode. One of the best shows in a while and a great start to 2018! Story about a girl who is always putting off her life because she is too scared to live it, that is till she meets another girl who is going forward with it. Yes, don't plan life, LIVE IT! Ever see a episode 1 of a show and go oh yeah this is going to be good?